Nick Rowe sent me a link to one of his posts alongside one that used it for an analogy in evolutionary biology. They're both interesting reads, so check them out. I'll wait. The basic idea is that competition should create a state for an economy or an organism where "fitness" should be maximized (the production possibility frontier saturated). In this state, any further change in production (or adaptations) should lead to trade offs. The organism or economy is at the boundary (set by e.g. 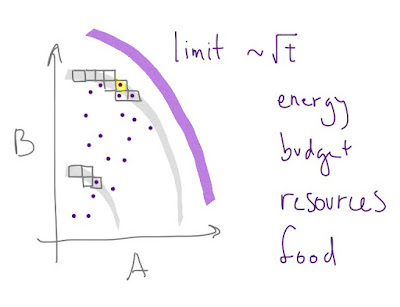 energy or resource constraints), so the only states available to move into involve trade-offs. Eagles as a species have really good eyesight, but can't hunt at night and economies produce the optimal amount of apples and bananas. Night hunting would come at the cost of day hunting and more apples comes at a cost of fewer bananas. 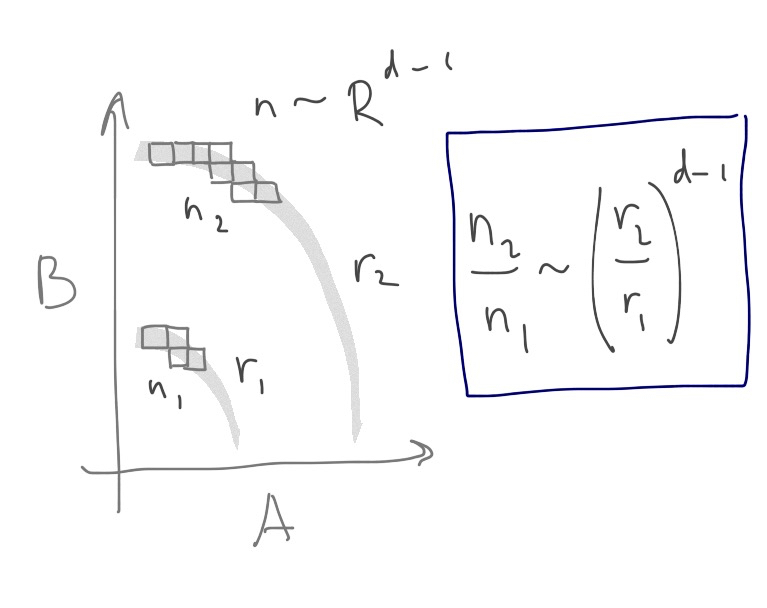 You can visualize both equilibria as the result of optimizing agents. Each eagle in the species tries to maximize food calories and offspring. Each firm in the economy tries to make the most money producing apples and/or bananas. As the boundary (production possibilities or available food energy) expands, the number of states in a swath near the boundary increases as the distance from the origin: n ~ Rᵈ⁻¹. Therefore the number of states at r₂ is greater than at r₁; if we take d >> 1 then most of the states will be near the boundary (in purple below). And because of that, the economy or species will most likely be in a state near the boundary (e.g. the one highlighted in yellow) after a random walk (purple dots). Those purple dots (economy or species states) are like the pollen grains in Brownian motion with the actions of individual companies or inherited traits of individual organisms being the water molecules randomly moving the pollen from state to state (position to position). 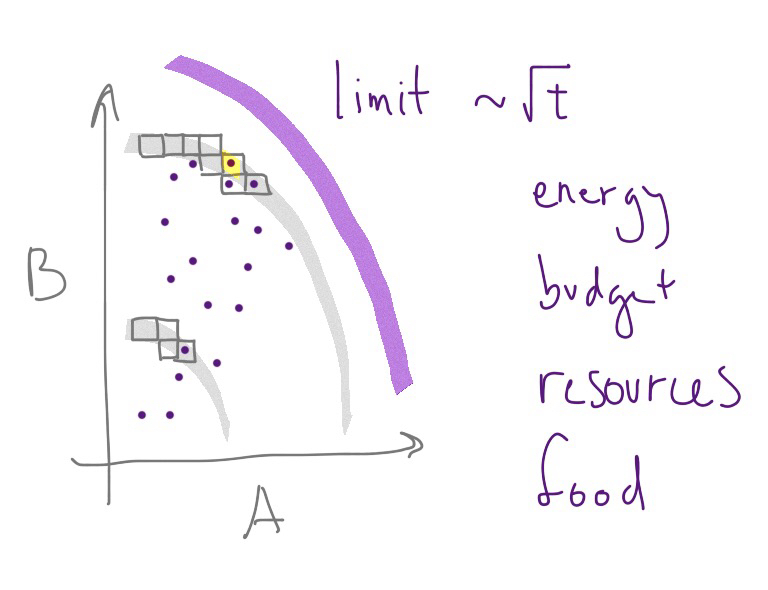 That boundary could be due to energy constraints or budget constraints, but it could also be due to insufficient diffusion time (r ~ √ t independent of d) to reach states that are further out. 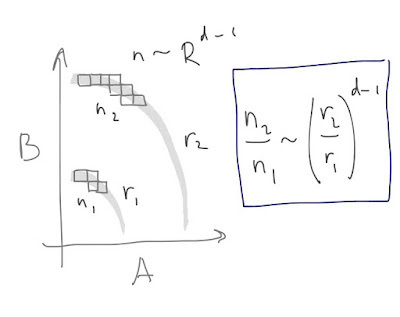 If the reason for the boundary is a constraint (not time), then movements from state to state on the boundary involve trade-offs, while movements in the interior don't -- as illustrated in the next figure. So we'd expect to see economies and species in states of maximized production and fitness, respectively, experiencing trade-offs between production possibilities and traits, respectively. Update 23 April 2017: I want to add that most of the states are in that swath near the boundary, so even random movements are more likely to take you to another state in the swath (i.e. a trade-off) rather than inward (fewer states) or outward (probability of occupying a state falls as you move towards or past the boundary) very far. End update. However, if the boundary is just time, then there really aren't trade offs. At least at the beginning of life, evolution (state space exploration) was probably limited by the mutation rate. Sexual reproduction (or gene transfer) seems to have enhanced the rate of spreading helpful adaptations, speeding up the state space exploration. But early organisms might not have experienced trade-offs because the state space was wide open. Sure, deleterious mutations would die out, but advantageous mutations did not necessarily come at the expense of another adaptation. However after billions of years, we should probably expect trade-offs between many adaptations. What about trade-offs in economics? Nick Rowe points out that sometimes there aren't trade-offs (exemplified with fuel injection), but says most of the time we should expect them in a sense for similar reasons in biology: competition and grabbing free lunches. However I'd like to connect this discussion to David Glasner's macrofoundations. What determines the total amount of apples and bananas that can be produced in an economy? The number of people willing to buy and the money available for them to purchase them at the equilibrium prices. By another name: aggregate demand. The PPF for all goods and services is bounded by the total aggregate demand. In the long run, AD grows with time -- meaning that the boundary is just time. In this case there are no trade-offs. The economy can start to just produce more bananas with its economic growth without reducing the number of apples. In the short run, however, there is an equilibrium level of AD (e.g. the crossing point of an AD-AS model diagram). In this case, there are trade-offs. There is a trade-off even for a linear boundary (e.g. 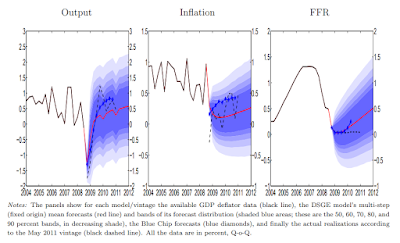 a budget constraint) but let's consider the bowed-out curves illustrated in the pictures above -- corresponding to upward sloping supply curves. Rowe explains the bowed-put PPF in terms of comparative advantage or differences in utilization of factors of production (e.g. apples are more labor intensive than bananas). There's another possible explanation of the bowed-out curve. In the information equilibrium model, information entropy is equivalent to aggregate demand. Therefore the states with higher information entropy (i.e. states with more equal probability of finding apples and bananas) have higher AD relative to states with lower entropy (i.e. states with higher probability of finding either apples or bananas). Therefore AD near the middle of the PPF is slightly higher. This leads to a bowed-out PPF and upward sloping supply curves. Regardless of how you obtain it, the bowed-out curve -- plus the trade-offs and maximization at the (short run) equilibrium value of AD -- can be effectively described in terms of rational maximizing agents. But all of those properties follow from the macroeconomic conditions [and large number of products in the macroeconomy] describing the existence of a boundary [and giving reasons for being near it]. Without that bowed-out PPF, there are no trade-offs, no upward sloping supply curves, and no maximizing. These properties of rational agents are dependent on macrofoundations! And they only exist for small perturbations around the PPF established by that short run equilibrium value of aggregate demand. PS I'm not claiming originality here (much is borrowed from Nick Rowe), except for the d >> 1 explanation for maximization and the information entropy explanation of the bowed-out AD curve. I was unable to find any references for this particular take on macrofoundations of rational maximizing behavior, but that doesn't mean they don't exist. Added a couple sentences to the paragraph on evolution (and the one after it), which seemed a bit of a non sequitur without them. I wrote most of this on my flight home last night, and I forgot to finish up that bit between getting off the plane and posting it on the blog. At the same time, the increase of aggregate demand with time is a modern phenomenon. There have been long stretches of history, both in the East and West, where aggregate demand was socially and politically constrained. There is no guarantee that we will not see a return to such constraints. Just take a look at Europe today, where the powers that be have embraced austerity despite its human costs. When Nick Rowe asks “why do economists assume trade-offs”, I feel as you might if Isaac Newton had asked “why do physicists assume that apples fall from trees”. The answer is that this is what we observe in the real world. Why would anyone assume anything else? Suppose that you want to buy a mobile phone. Your decision criteria are: number of features (higher is better) and price (lower is better). You will see immediately that there is no phone which combines the highest number of features with the lowest price (north east in Nick’s pattern). It would not make sense for anyone to manufacture such a phone. You will also see that there are no phones which combine the lowest number of features with the maximum price (south west in Nick’s pattern). Someone might manufacture such a phone but no-one would buy it. That means the real market for phones is somewhere in the middle: phones which someone would be prepared to manufacture and which someone else would be prepared to buy. One viable option is a phone which maximises the number of features and also maximises the price (north west in Nick’s pattern). Another viable option is one which minimises the number of features and also minimises the price (south east in Nick’s pattern). In practice, you will see that most people will choose a compromise between the two, rather than choose one of the extremes (that is probably why Nick says that the line from north west to south east is convex). You see this same pattern in decisions of all types and at all scales. In the real world, decisions are made on more than two criteria, so Nick’s two dimensional version is overly-simplistic. You can see that some of the commenters on Nick’s post make this same point. The best generic decision model is probably that of a project manager who has to manage trade-offs between many time, cost, quality and risk factors. This is an example of economists’ total confusion on their role. If they are to add any value, they must start with what the rest of society already knows i.e. in this case that all decisions of any magnitude require trade-offs; ask the questions that the rest of society wants answered; and then provide insights into the answers to those questions. This confusion is evident in many aspect of economics. If you read the bloggers from the finance sector (e.g. Cullen Roche, JKH), you will see that they are consistently frustrated by the fact that many economists don’t understand even basic facts about the banking system e.g. that banks don’t lend out reserves. How can economists add value to subjects when they appear to know less than other people? Regarding evolution, there are different types of trade-off. Some designs just don’t sit well together. For example, mobile phone designers have probably pursued the idea of smaller and thinner phones to its limit. Smaller screens are more difficult to read and small touch screens are difficult to use when you have large fingers. As a result, phones are now getting bigger again to optimise the balance between size and usability. I suspect that this type of design compromise is also similar to what happens in evolution although obviously the pace of change is much faster in man-made systems. Finally, at a macro level, most changes in natural and human systems can probably be considered as random experiments. Some ideas fail and are discarded. Other ideas work and are pursued. Similar ideas often work in different contexts, so we see repeated patterns e.g. two eyes, rather than one or three, in many species. This gives the impression of maximising behaviour but it is really just random experiment plus ruthless purging of failed experiments. This is why information transfer economics might have a future. The issue here is not that individuals face trade-offs, but that macroeconomies and markets face trade-offs. But they don't really -- economic growth means you can just have more yoga classes without people necessarily losing mobile phones. And many new inventions or products are all about the case where there may have been a trade-off but it isn't any more. Rowe points to fuel injection leading to better fuel economy and more power. 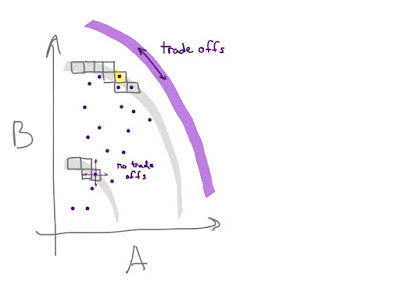 Saying there are always trade-offs is saying there are no win-win scenarios. Not everything is zero sum. This is big in Keynesian economics -- fiscal stimulus is supposed to be a win-win. The neoclassical model says that fiscal stimulus comes with a trade-off of higher future taxes, so it becomes a trade-off (i.e. trade-offs are always assumed). So the question is: why does it seem like everything is zero sum? What conditions make it an effective zero-sum theory? The answer above is that near a macroeconomic equilibrium, you have an effective theory trade-offs. I tried to point out a classic win-win (no trade-off) situation in the comments section on Breitbart.com a while back: why not allow open carry at GOP debates? Theoretically it should maximize both freedom and security. Yes, I was being a troll, but I was genuinely curious what the responses would be. Somebody lectured me about the nature of private venues or some such. Not very interesting. As is almost always the case when I think I've had an original thought, I later found somebody out there that had written an essay asking the same question (on Huffington post or some such). Economics is changing, but in what direction?